V-Ray 3.5 for Maya has been released by Chaos Group. 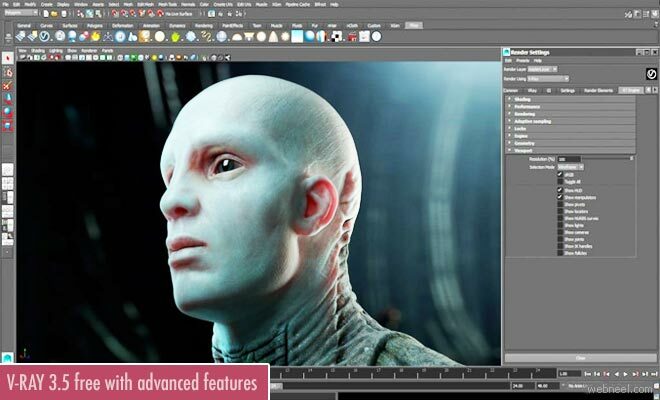 V-Ray 3.5 uses adaptive lighting, which makes the 3d animation characters highly defined and it's quite fast. A new addition is that of Adaptive Lights, a fast new lighting algorithm that speeds up rendering in scenes with many lights. With Adaptive Lights, V-Ray determines which light sources are most important, so ray-tracing calculations are focused and more precise. When tested on multiple CPU and GPU scenes, render times were typically two to seven times faster. “At Digital Domain, we used Adaptive Lights extensively on The Fate of the Furious. It allowed us to render highly complex environments with thousands of lights in a fraction of the time compared to what other renderers could offer. We saw 4X speedups per frame, which significantly helped our render throughput on the show,” said Carlos Cidrais, lighting lead at Digital Domain. If you already have a V-Ray 3.x, you can update the V-Ray 3.5 for free.